The next couple of weeks we will be camping with our good friends Carol and Ann. 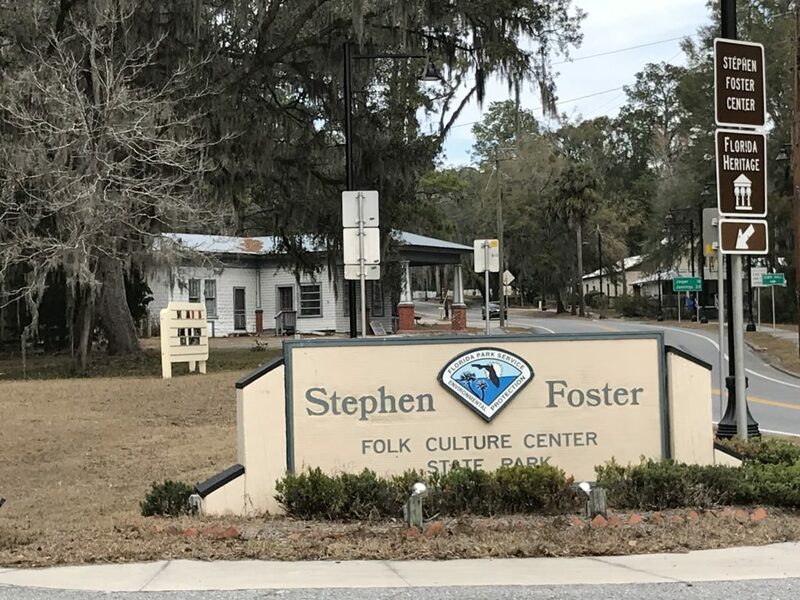 Today we are headed to north central Florida to visit Stephen Foster Folk Culture Center State Park in the small quaint town of White Springs. 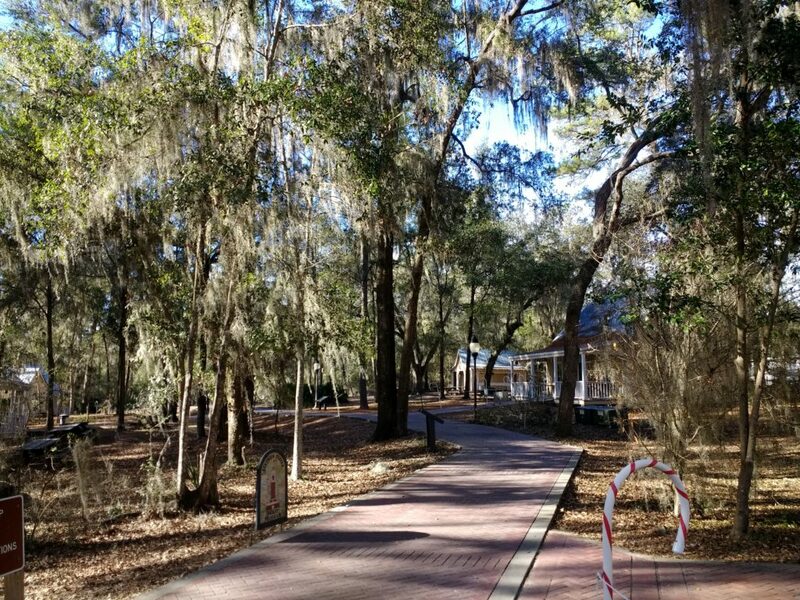 Old Folks at Home – which starts out, “Way down upon the Suwannee River,” this became the Florida State Song and the Stephan Foster State Park is on the banks of the Suwannee River. The campground was very nice, and we had a site right next to Carol and Ann. You can see their rig on the right. The sites were deep and spacious and there was lots of vegetation between them for privacy. The park has a Carillion Tower that has 97 bells in it that plays Foster tunes many times a day. The bells were installed in 1958 and at that time, it was one of the largest instruments ever produced in the Western Hemisphere and was the world’s largest tubular carillon. Unfortunately, the bells broke last April and have been silent since then. 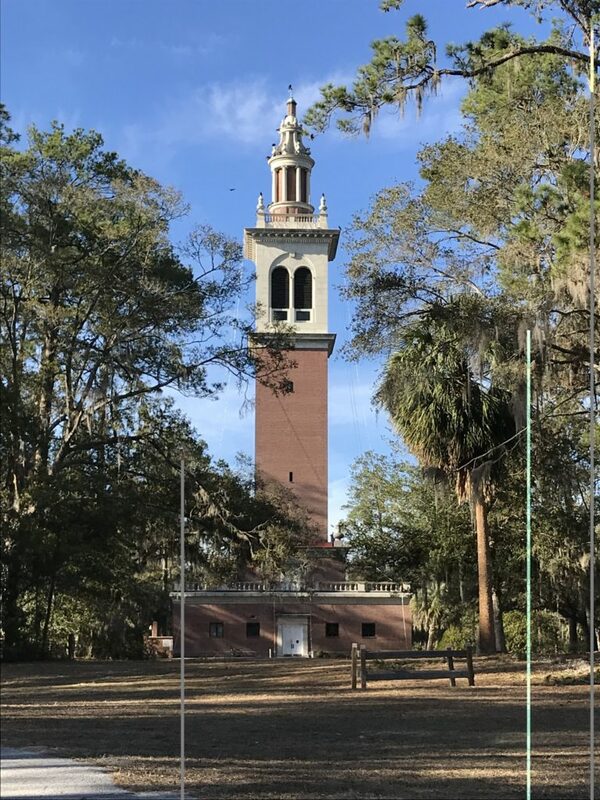 The park is working to get a grant to fix the bells which may range from $30,000 to $190,000 depending on how far away they want the bells to be heard. The park celebrates Florida’s cultural traditions and has a Craft Square where demonstrating artists share their talents. The crafts included pottery, fabric, blacksmith, stained glass and basket making. The craft square was near a gift shop that sold the works of the craftspeople. 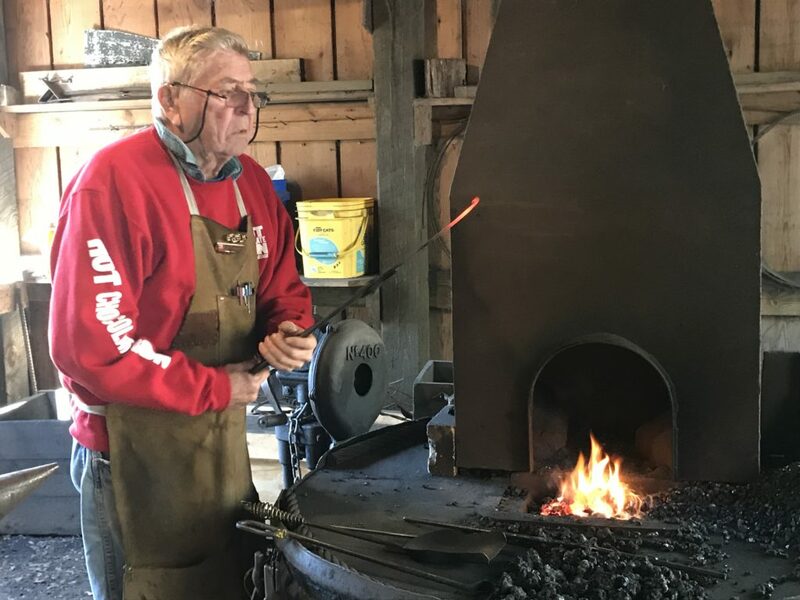 This blacksmith, Al gave the four of us a private demonstration. We also learned a lot about the different types of coal. He was very happy to share his knowledge with us and answer all of our questions. We bought a lover’s bell that was in the gift shop that Al had made. The folk lore is that if you ring the bell, you get a free hug! 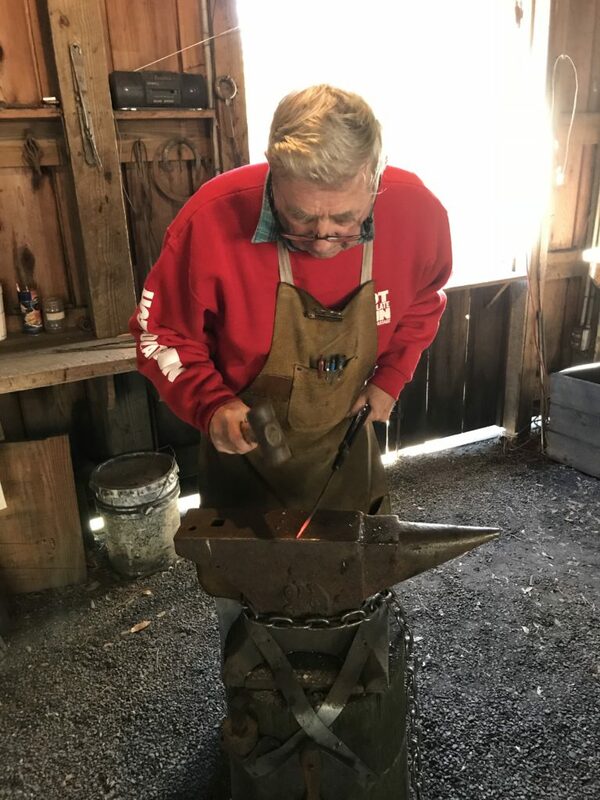 He made a few items, one being a drive hook which he is making in the picture below. Drive hooks were made for hanging items in workshops or barns and had a sharp point on one end for driving into a wall, and a hook on the other end. We visited the White Sulphur Springs site which once was a popular health resort that attracted large numbers of people to drink the water and bathe in the springs. The structure in the picture was built in 1908 and housed the springs, a concession area and clinical examination and treatment rooms. The springs were said to cure everything from rheumatism and indigestion to dandruff and insomnia! 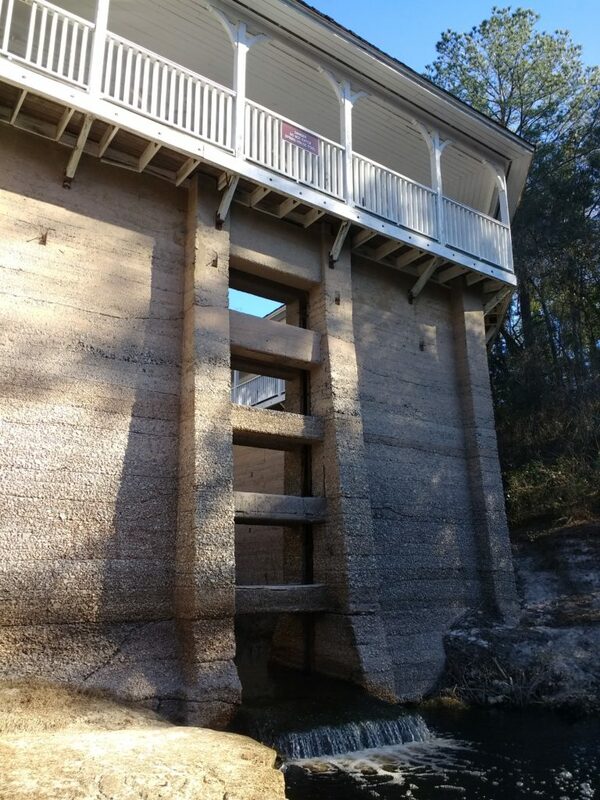 The spring waters empty directly into the Suwannee River and had a flow of 28,000 gallons per minute. 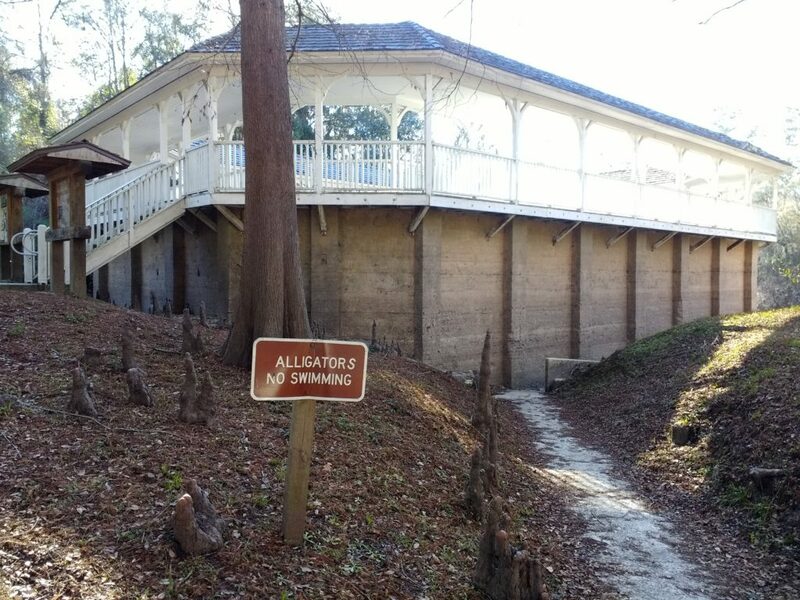 We didn’t think we would want to go swimming here due to the alligator warning! 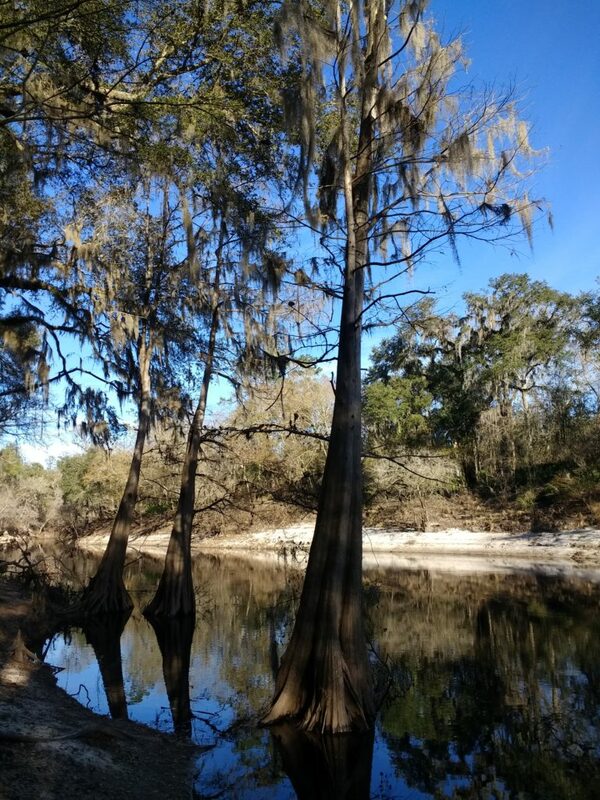 This is a picture along the banks of Suwannee River. In it’s heyday, the Suwannee carried many passengers on paddle boats and steamers. It starts in Fargo, Georgia and flows over 270 miles southward into the Gulf of Mexico. 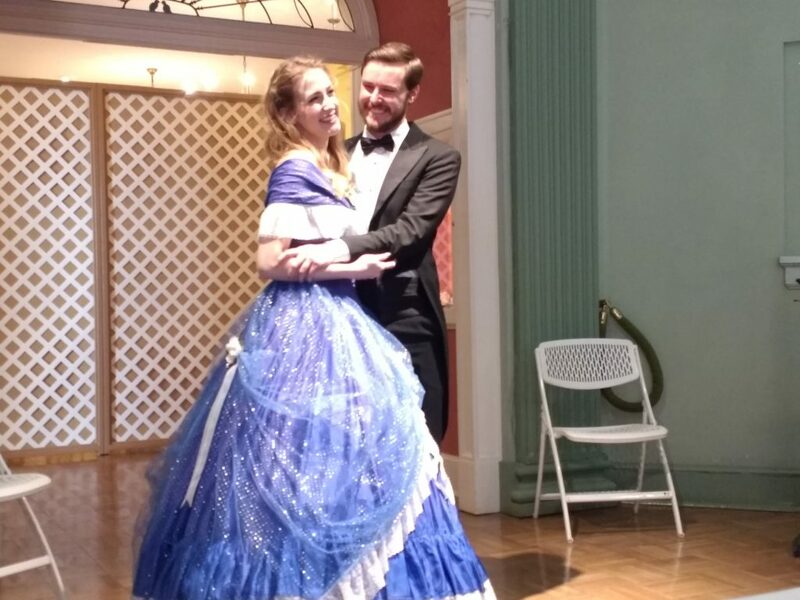 We were extremely lucky to be at the Stephen Foster Park during the January celebration of Stephen Foster Day. 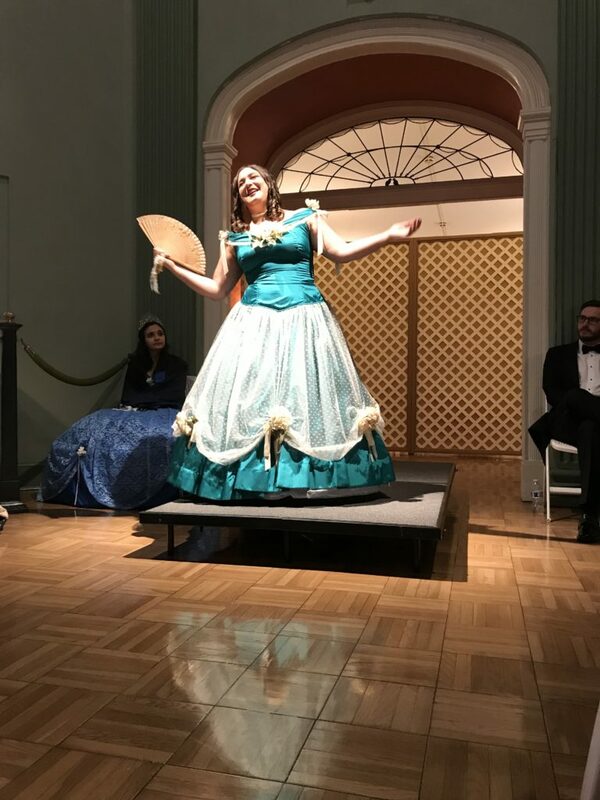 While we were at the park, the 67th Annual Jeanie & Stephen vocal audition was going on. We enjoyed watching the participants performing in their period costumes. The girl below was auditioning for the Jeanie part and was the winner. The next afternoon there was a performance given by last year’s winners that was filled with music and was a joy to watch. We were able to listen to live music 5 days! 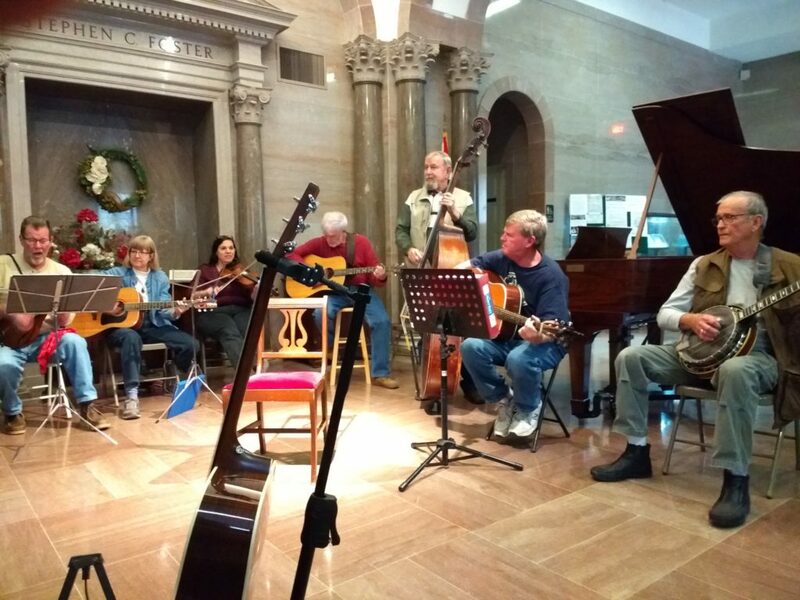 We got to listen to Appalachian Dulcimer, piano, and folk jams with numerous people from the community and the volunteer park staff. Many of the park volunteers at this park work here so they can participate in the folk jams and be surrounded by music lovers. We enjoyed talking with our camp host Ron who played banjo and guitar at the jams. It is always fun to check out local restaurants, even though this was the only restaurant in town! 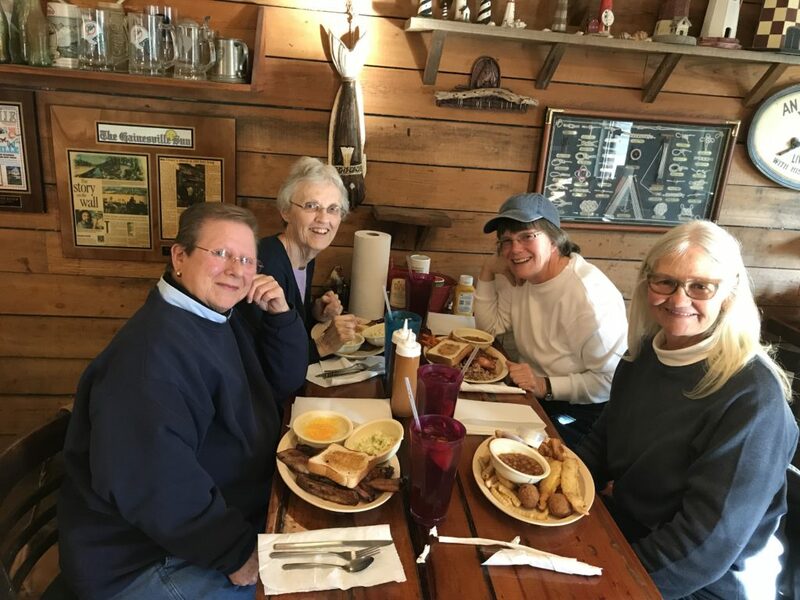 We had heard good things about Fat Belly’s whose specialty was BBQ and fried catfish. While we didn’t leave with “fat belly’s”, we certainly had “full belly’s”! Ya’ll come back now, ya hear?!?!?!?! 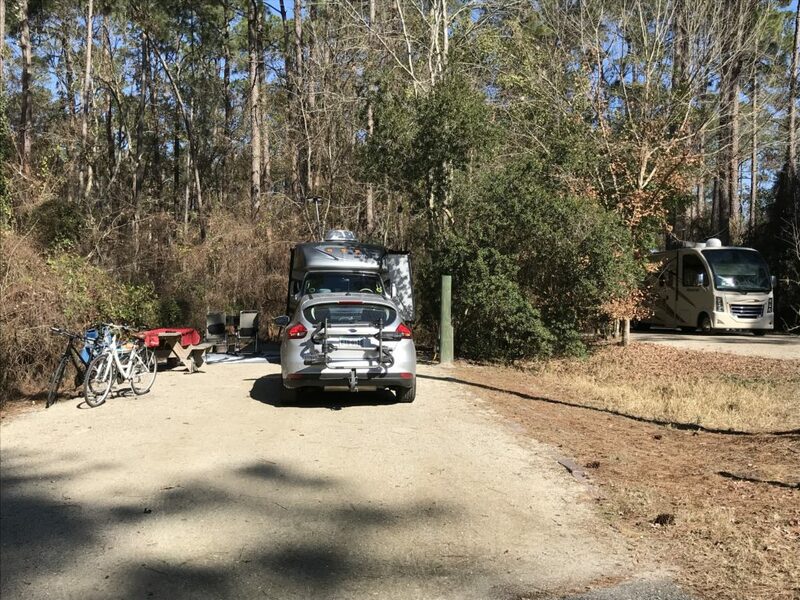 This entry was posted in Florida and tagged Stephen Foster State Park, White Springs. Bookmark the permalink. You two seem to find special places and people…it is a joy to travel along with you in this blog. What perfect timing for you to be there and enjoy all the festivities!!! Another awesome post with great pictures! Thanks for sharing!